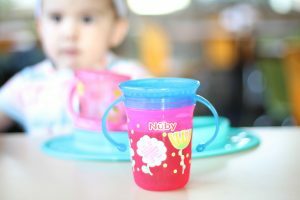 I received the Nuby products for an honest review. This post contains affiliate links (with a purchase a small commission can be made to help keep this blog going). As always, all thoughts and opinions are 100% my own. We love going out to eat… I mean I don’t know about you, but I prefer to not cook with a toddler on my ankle or in a carrier. I like no clean up and being pampered during mealtime. When I go out with Izzy I always have goodies to make mealtime easier for my husband and I. So we can be hands off as much as possible. What do you need when going out? 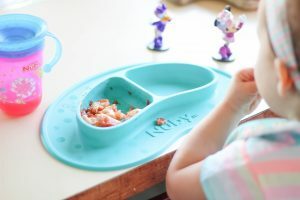 A snack container (for the car ride to your destination and once you get there before food comes out), a plate, a cup, a bib and silverware. Those are the essentials at least. For bibs I keep a few disposables in the diaper bag incase I forget to pack a fresh one, because that happens all the time. I also keep some toddler friendly forks and spoons for Izzy. Here are some products you have to check out! They are all really great for home and out! 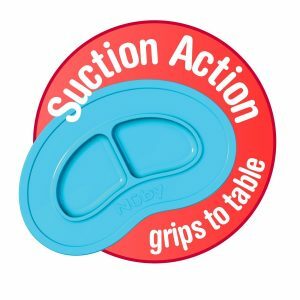 Nuby‘s Miracle Mat comes in a couple sizes, but the one shown below is perfect for on the go. I can easily fit it into our diaper bag. Once the meal is over I just rinse or wipe the Miracle Mat out at the restaurant before putting it back into the bag. This is a must have in the car, stroller, grocery store, and in the resultant as you wait for food to arrive. The top allows their hand to get the snack without spilling it everywhere. Available at Babies R Us & on Amazon! 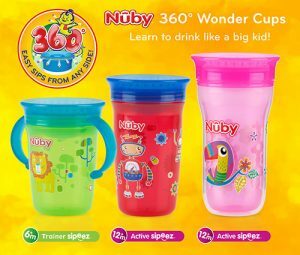 We have the trainer and active sipeez from Nuby because sometimes Izzy likes a handle on her cup. 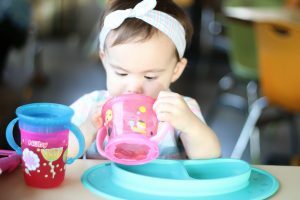 This cup allows her to continue practicing drinking from a cup but the cover keeps her from spilling when I’m not being a helicopter mom. How does it work? Once their lips touch the edge of the cup (putting pressure) and they start sucking the liquid comes out. 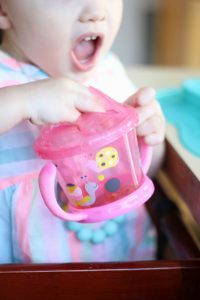 The Ultimate Toddler Cup! Practice real drinking from a cup without the hovering parent. 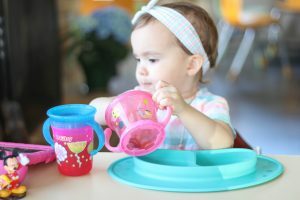 I really love Nuby products! This is a company that constantly works to better the products they put out. I have seen big improvements in their snack container and the mat! It’s important to find companies that truly want to make your life easier as a parent and I really feel Nuby does that. Yes same! We clean enough right? 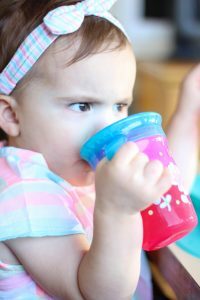 I love how serious she looks as she’s sipping from her cup haha! So adorable! And so many great products! I’ve always wanted to try that mat! I seriously need all of these things! My son demands independence but I’m OCD mess mom so I hate to give in! The Miracle Mat looks awesome!!! Oh this would be great! I haven’t got the chance to try out any of the Nuby products but definitely need to! It’ll help with the messy car spills my toddler keeps havimg?? Love Nuby! The snack keepers are amazing! Oh man I have never tried the mat and I think I would love it if I did! The may is a great idea! I need to try that mat! We have and use all of these products for our kids. Nuby is the best! Love the miracle mat!! I just bought a pink one! why do I not have that miracle mat in my life??? I love that mat! And those snack cups were always a lifesaver!